It’s 2018. Is Your Internet Marketing Stuck in 2012? We all know that dentistry has changed dramatically in recent years. Like most AACD members, you’re probably spending considerable time and money staying current with the latest advances. But are you staying up-to-date with your practice’s internet presence? As dramatic as changes in dentistry have been, the changes in internet marketing have been just as dramatic and many times faster. If you don’t keep up, your website performance will lag and your new patient numbers will dwindle. There isn’t space here to address all of the trends in internet marketing, but here is an overview of four of the changes over the past five years that may affect you the most. I remember when it was all about getting a #1 ranking on Google. If you had that top spot, people would call. They were very forgiving of a poorly designed website or awkward navigation. Over the past five years, however, competition has ramped up, and visitors have been getting more discriminating. Our research shows that patients seeking a cosmetic dentist will check out three to five websites and will call the dentist with the website that impresses them the most. If the website looks old fashioned or doesn’t generate a feeling of trust, they’ll go to the next one. Beginning with its Penguin update in 2012, Google has been waging war on what it calls “website over-optimization.” Basically this means that rather than rewarding the old SEO tricks that we used to use, they now penalize them. It used to be that we could use meta tags and link-building strategies to deliver high rankings rather quickly. Not so any more. Now Google rewards quality websites with a good user experience, quality content, and an up-to-date design. We have seen clients who have held down a #1 ranking for years begin to drop in the rankings. Often all that is needed to bring them back up is a re-design and freshening of their website content. No tricks—just a quality website. "Now Google rewards quality websites with a good user experience, quality content, and an up-to-date design." If your rankings have dropped or phone calls from your website have slowed, a website redesign may solve your problem. According to surveys by BrightLocal, in 2010, 21% of consumers said they regularly used online reviews in selecting a business to patronize. That number has increased steadily and passed 50% in 2016. For some businesses such as restaurants and hotels, as many as 80% of consumers will consult online reviews. 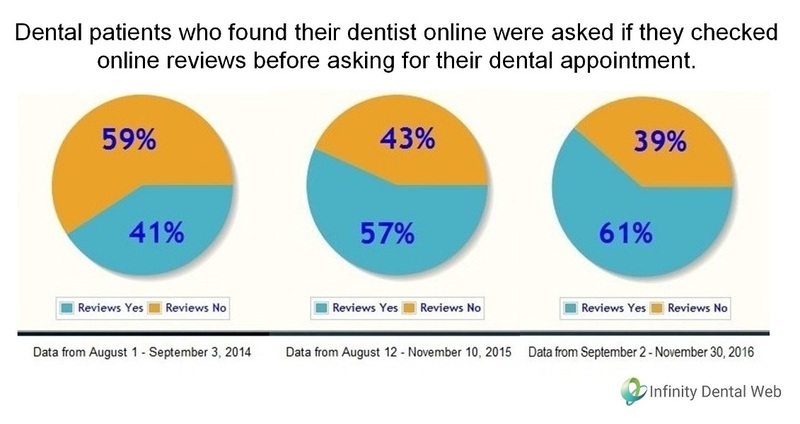 Here at Infinity Dental Web we constantly monitor the use of reviews by prospective dental patients. In 2014, 41% of patients requesting an appointment reported to us that they had used online reviews to help them make their decision. Last year, that increased to over 60%. People are also getting more discriminating as far as which review platforms they will trust. More people trust Yelp, for example, than Google reviews. People also give low credibility to reviews posted on your website, as opposed to reviews posted on a trusted reviews platform. But if people believe the online reviews are authentic; BrightLocal’s 2017 survey reports that 84% of them say they trust them as much as a personal recommendation. As far as Yelp goes, it is growing in importance. Do this simple test. Google “best dentist in _________” and insert your city. I did that with ten random cities across the country. In nine of the ten, the #1 ranking in Google was given to a Yelp result. So if you want to be found for that search term, a strong Yelp presence would be an excellent strategy. What should you do about reviews? Pay close attention to them. Ask your patients to leave reviews, and respond politely to any negative reviews. They are coming to have a huge impact on your marketing. Over the past few years there has been some litigation over the issue of whether website accessibility is an issue covered by the Americans with Disabilities Act. While this litigation dates back as far as 2010, it was brought to the attention of dentists this past year when a lawyer in Texas began trying to drum up business by writing threatening letters to dentists alleging that their websites were not accessible to people with disabilities. The United States Department of Justice is expected to announce accessibility standards for websites in 2018. Until it does, we won’t know whether they will apply to websites that market dental practices. Some courts are interpreting the law to say that only online retailers who also have a physical location are required to meet accessibility standards. Other courts feel that all businesses offering goods or services online should be regulated. There has not been a successful lawsuit against any dental practice over these standards. Still, at Infinity Dental Web we feel that it would be prudent to make sure that your website adheres to basic accessibility guidelines, such as providing text descriptions of images and meeting certain readability guidelines. We are also recommending that clients who want the maximum protection against the risk of lawsuit have a stripped-down black-and-white version of their website that can be activated by clicking an “accessibility” button in the header. So you’re into digital impressions, hard-tissue lasers, and metal-free dentistry. Congratulations—you’re staying up-to-date in the operatory. But it’s actually easier, less expensive, and more financially rewarding to bring your marketing up-to-date.